Okay I know it’s not a crazy amount but when you put in perspective of the whole journey, I honestly never thought I’d be able to pull that kind of money in…EVER. I’m sure you can relate. Tell any of your friends that you’re making money from your blog and you usually get the you-got-to-be-kidding-me stare. For you as a blogger, my hope is that income reports gives you at least an idea from one travel blogger’s perspective of how it is possible to make blogging a legitimate business. In addition, I think it’s incredibly valuable to see the contrast between one blog to another. Where I may have success may be completely different from yours so don’t be worried if you’re not going along the exact same path that I am. Everyone has a different trail to the top. Persistence, hustle and focus is the name of the game. Alright let’s go! 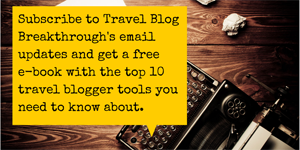 So how did Going Awesome Places and Travel Blog Breakthrough fare in April? 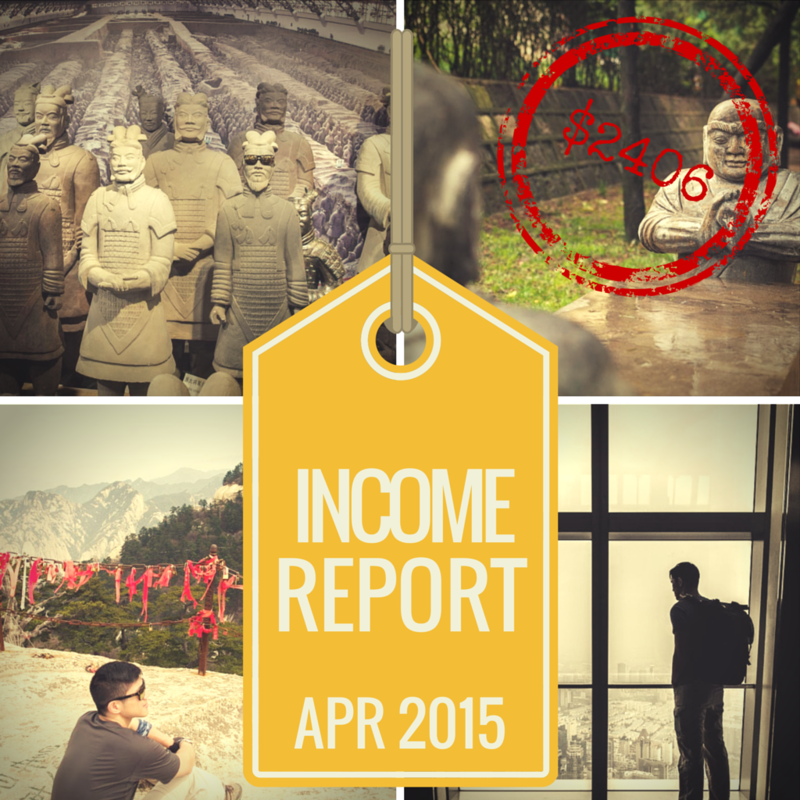 When I think back on March’s income, not a whole lot changed except for one thing – video. Continuing looking to diversify my income, it was nice (and a little scary) to be able to explore something totally different. The other food for thought this month was that I was away in China for half of it. So if you think about it, I really only put 2 weeks worth of work and put everything else on auto-pilot for the other half. It just takes a little planning. So let’s dive into how a few of these streams made a difference this month. While the blog will always be the core of what I do as a blogger, this was an opportunity that popped up through networking and identifying opportunities. During Affiliate Summit West, I had a meeting with someone that worked at Tours4Fun and had a great chat about the future of blogging and asked what kind of projects they were looking to get into this year. That led to a talk about the emergence of video and Tours4Fun wanting to start producing more content. Fast forward to April and I was able to negotiate with the team a pilot project. It was my first big freelance video gig and I was nervous about how it would turn out but I was pretty happy with the results and so were they. Check out the Segway Ontario video. 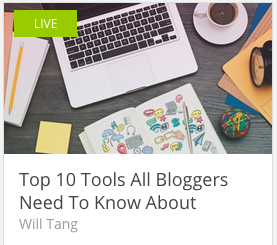 Lesson: Know what you’re good at don’t be afraid to built up those skills to help augment your blog. Lesson 2: When working as a freelancer, always think about how you can add significant value to the client. It’s not about you. It’s about them. Craft a proposal that they can’t say no to. In big news this month, I actually hit $200+ in revenue for the first time. That’s huge considering I felt totally dejected a year ago when I was pulling in barely $20. That’s a 10x increase. What I do have to be careful about especially as I plan a site rebuild is how many ads/pop ups I end up having on the site. I have received a few comments about there being too many ads and pop ups on my blog and so I know that is something I’m going to have to aware of. For the second month in a row, The Blogger Network (TBN) dominated in the advertising space. Overall, all of my stats seemed to have gotten a boost with the best part being that my filled impressions was up by over 10,000 which led to this month’s increase in revenue. As much as I want to get rid of Google, I saw another surge this month in earnings going from $53.33 to $68.95. Looking at the dashboard below, I’m sure my increase in page views from 37,909 (+888) had something to do with it. More importantly it was really my clicks, up from 136 (+48), that really made a difference since so much of Google AdSense is about CPC. Nothing really new here in terms of ad units. The above article 468×60 unit right before my blog post starts is still bringing in a majority of the income. I think Google gets pretty smart about this space because text ads typically get displayed here and readers must either think these are part of the blog post or they see very relevant ads to the content on the page. Contrast this to the sidebar which is way more impressions but so many less clicks. In future layouts of the website, perhaps I need to think about doing less with the sidebar and more ads threaded throughout the blog post (top, middle or bottom). Now lets look at geography. The trio of USA, Australia and Canada killed it again this month and so it’s looking like this is going to be the case for me month to month. So what you ask? Well now that I know which countries are more likely to click on ads, the question I need to think about then is for future targetting I do (i.e. Facebook ads), I really should just focus on these 3 countries because they bring in that much more value to me. Get my drift? Again no surprises here. 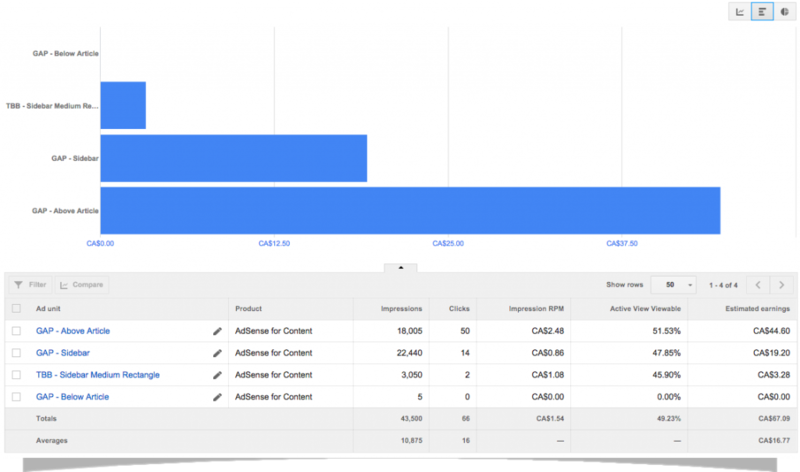 Text ads rocked it as they always do and this correlates to my theory that readers tend to click those text ads when placed right above the start of a blog post. I’m not sure “tricked” is a good word to use but I think Google just does a really good job at retargeted and contextual ads on my blog. One thing I’ll mention here is that the reason why video shows up with $0 estimated earnings is because it’s tracked separately on YouTube. I get incredibly Impression RPM but because I don’t drive enough impressions I don’t make a whole lot. Desktop dominates through and through but I have to ask myself how I can do a better job at optimizing mobile for ads. My theme essentially doesn’t display ads at all and so I’m losing out on a lot of opportunity there. Time’s ticking on Sovrn and while the income saw a bump, I’m thinking I’m better served at just consolidating this space into The Blogger Network. It just makes a lot more sense from a management perspective. One less thing to track. Continue to test, measure and tweak. 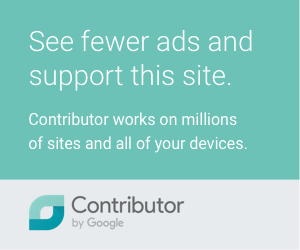 Does having an ad block right above the start of your blog work for you or do sidebar ads work for you? Try it out and see the results. Keep doing what performs well and adjust the others. April was pretty terrible for affiliates. 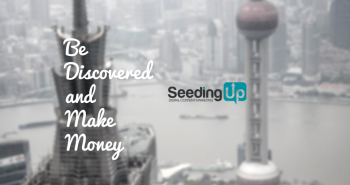 I made most of the money off of two sales – one for Siteground and the other for StudioPress. I’d love to get this to a more healthy state. I’ve signed up for HotelsCombined and want to test out more hotel booking features on the blog. There was a small lull in the work I was getting from CopyPress for Hipmunk so I reached out to them and then I started getting a new barrage of assignments. Good thing I gave them that nudge because otherwise this would’ve died out completely. I’m still working on building out more freelance writing opportunities. There were a couple of sponsorship opportunities this month. One of them was Competitours and the story here is that I had signed up for their 2015 trip and I wanted to write a story on it. Instead of just going ahead and writing it, I figured I had nothing to lose to ask the organizer whether they’d be interested in sponsoring a post. To my surprise he said yes and told me how much he’d pay. I was happy with those terms and that was that. The Travel Underwriters Twitter chat came about from one of the Facebook groups I belong to. While there were a lot of complaints that the price they were willing to pay was too low, I felt that it was a good opportunity to build a relationship with a new brand and ended up taking the offer. The Twitter chat went well and now I have a new opportunity to do get paid to host a Twitter chat in July/August. Lesson: Think long term. While MOST of the time I’ll tell you to stick to your guns in terms of price you’re willing to accept for sponsored work but the exception to that is when you want to build relationships especially with big companies. The opportunity is in recurring work. Here’s a look at my traffic numbers from April. Overall, April was a much better month in terms of traffic with several days going above 1,000 sessions. April saw a significant dip in traffic to TBB. That being said, the comforting part about this drop is that the bounce rate dropped quite a lot. This means that users are sticking around the site once they do land on the page. I definitely need to do a lot more work to build traffic to the site. 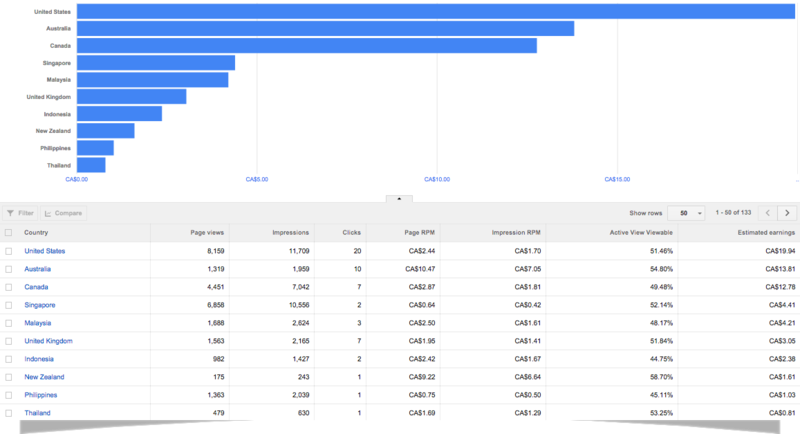 This is a part of the analytics that I always keep a close eye on because diversifying traffic away from just relying on Google is so important in order to grow. Pinterest close to doubled again this month so loving the trend here. My efforts are paying off! After doing a little tweak to my ReviveOldPost schedule, I was able to bring this number up again. I simply added more auto tweets to go out overnight (day time for my Asia friends). Another great reminder to remember your fans from all over the world. Leveraging deal forums like Red Flag Deals for contests is an effective way to get a boost to entries and also hopefully capture more long term readers. Keep an eye out for Yahoo and Bing as they continue to stay in the mix. While Facebook is on the decline, it’s interesting to see that readers have the lowest bounce rate when coming from there. Bing also has amazingly low bounce rate, pages/session, and average session duration. More valuable search users?? Interesting but not sure how to leverage this fact. Search query impressions up 561 and clicks are up by 31. No significant change from last month. “Airbnb Copenhagen” came out of nowhere this month. I did a quick check and it’s ranked #5 in Canada which is great news! Another win-win for being part of the #HipmunkCityLove project with CopyPress. 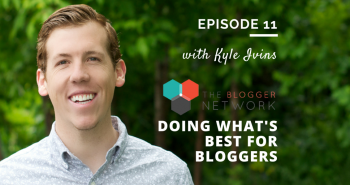 Episode 11 just came out and in this one I sit down with Kyle Ivins, co-founder of The Blogger Network and we hear it straight from him the story of how they built the company and why they care so much about bloggers. For a limited time, I’m offering the course for ONLY $5 to all of you super fans. Use code APR5TBB. There are only 5 codes and it expires June 7, 2015. May went by so fast that I never got a chance to finish this income report earlier. As you know I had a big China trip in April and after I got back, as usual there was an insane amount of catch up. I still have a few more episodes of China to put together and of course I’m continuously looking for more opportunities to go after. Pinterest investment is paying off. Freelance video is could be a great way to augment income. Don’t be afraid to try new things. Building relationships trumps asking for big money. Great job Will! Love following your progress. I hope you break 3k next month. Congrats!! $2k is a great barrier to break and it’s just one of many you will 🙂 Awesome to hear you got a good relationship out of Affiliate Summit, it just takes one to make it all worth it! Thanks Samantha! It has been a slow climb but finally made that threshold in April. I can’t say the same will be same for May though but I think the consistency part will be the key moving forward. I’ll always have fond memories of Affiliate Summit because I was able to meet you and Yeison in person!! 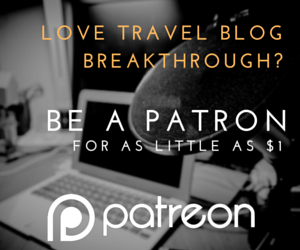 Fun to read a out people earning money from travel sites! I will continue to follow your site, keep up the good work! Thanks for stopping by Mike! Just doing what I can to help my fellow bloggers. Will, thank you for sharing. I have used your link to sign up to The Blogger Network so it will be interesting to see what kind of results I can achieve, noting that my traffic is lower than yours :). 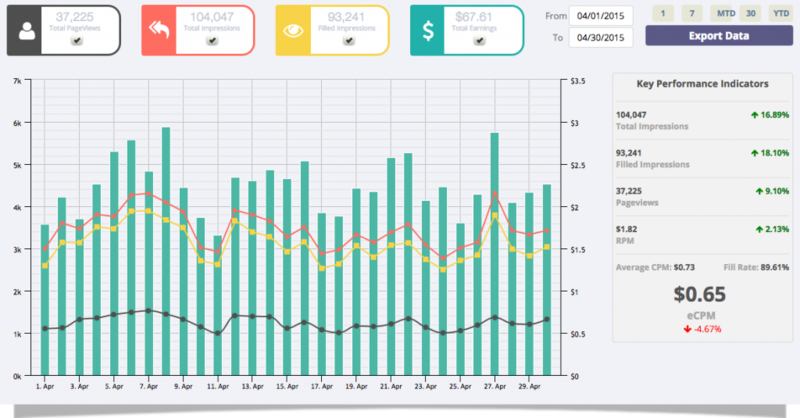 Really loving the detail you put into your income reports – impressive! I’m putting together a roundup of income reports from a whole heap of bloggers and would love to feature your blog in it if I may? I’m currently collecting figures for May. When wil you be publishing your May figures? Let me know and i’ll get you included in my post. Thanks Raj! Sorry for taking awhile to get back to you. I’m hoping to work on the May income report in 2 weeks. Been swamped with so many other projects but definitely keep an eye out. Best way to know when something is out is to follow my FB or Twitter account. Whats your best tips for getting more visitors? – And why do you think the visitors keep coming back and also, what makes the visitors click your ads? Good content is absolutely one thing, but that can´t be all? Congrats! thank you for sharing! How to earn much money like you?